She was commissioned by a yachtsman who previously owned a 23ft trailer sailer but found that most such boats spend long periods on the water between trailering. The annual holiday was the exception, with the boat towed to the chosen spot, used as a caravan en-route, cruised for the duration of the holiday then returned to home base. This led to the conclusion that a slightly bigger boat would be practical as a trailer sailer while also giving more comfort. A larger tow vehicle would be needed and night towing would not be allowed due to the greater beam. However, the boat would be large enough to be a successful coastal cruiser, expanding the cruising capabilities. 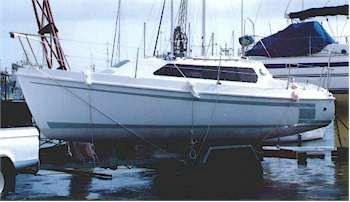 She is a development of the TLC 19, a variation of which Anthony Steward sailed around the world in the only open boat circumnavigation ever accomplished. A compact cruiser with shallow water capability, she will be as happy on protected inland dams, lagoons and estuaries as on exposed coastal waters. She is also available with a fixed keel for those who do not want shoal water capability. Hull shape is modern, U-shaped up front and slightly Veed aft. The spoon bow gives reserve buoyancy and a dry boat. Wetted surface is low for light air performance but the sections are powerful for heavy air stability and speed. The drop-keel is a relatively high aspect cast iron foil with cast lead ballast bulb. The fixed keel is a lead casting attached to a moulded stub which adds the advantage of a bilge sump. Deck layout is clean and simple, allowing for all halliards to be led aft. The cockpit, nearly 2m long, has a walk-through transom to the divided sugar scoop, the two halves of which are separated by the transom hung rudder. A transom door and bridgedeck give safety from boarding seas. 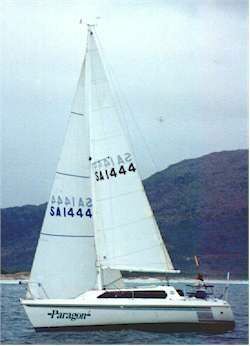 The bridgedeck-mounted mainsheet traveller is a minor obstruction when beating but is the most convenient for short-handing and does not wrap on winches as mid-cockpit mainsheets are prone to do. The rig is fractional sloop with swept spreaders and a tall fore-triangle, for performance without complication. The mast of the drop-keel version is hinged for ease of stepping. The layout is open, large for a 27 footer and comfortable. The double forecabin gives privacy for family cruising and foot boxes give length for the settees to be used as berths. The drop-keel casing is bonded to the bulkhead and forms part of the central saloon table. When down, the drop-keel is hidden inside the table. The galley is compact and easily worked, with two-burner gas stove, sink, icebox and lockers. A drop-in cutting board over the sink increases the work area. The quarter berth is accessed through the galley and is larger than will be found on many 33 footers. The head is fully enclosed and spacious, with basin, chemical toilet and wet locker. The forward face of the head/saloon bulkhead, over the port settee, will be used for any navigation electronics installed and the port leaf of the saloon table used for navigation. There is space for a small inboard diesel engine under the cockpit. For those who prefer an outboard motor, it can be mounted on a transom bracket. This is a GRP production boat in South Africa, built by Macdev International, or she can be built from scratch with normal one-off sandwich GRP methods. For a smaller yacht of similar concept, see the TLC 19. Click here to view the list of drawings or stability graph for this design.